The Burj Al Arab (for you Anglophiles, the Tower of the Arabs). An iconic hotel and Dubai landmark, I'm sure you are familiar with it from the ubiquitous pics, models and ornaments that you see on the internet, TV and all over Dubai. I was surprised to learn, when I did a little research that the Burj Al Arab has been open for almost 17 years. In this town 17 years is a very, very long time indeed. So the place really must have something about it. As you approach the hotel over its private bridge and drive toward the sail-shaped building you can appreciate how spectacular it really is. Those that have visited Dubai and the hotel will know exactly what I'm talking about. Last Saturday the Burj Al Arab was every bit as busy as you can imagine all Dubai hotels would be; this being the last weekend before the Holy month of Ramadan starts. In Ramadan the city and its hotels slow down, somewhat. As we arrived we were greeted by hordes of valet car-park attendants scurrying around trying desperately not to leave anyone waiting in the heat too long. 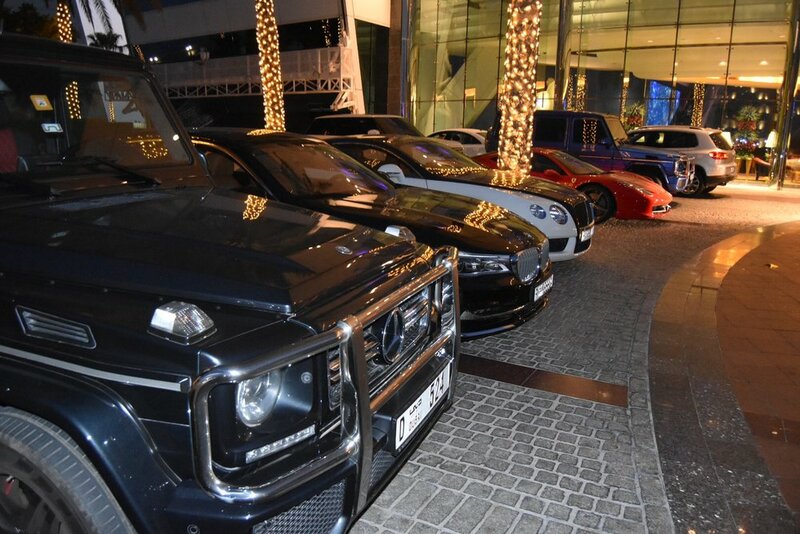 As we were relieved of our car you could not help but notice the array of cars parked up at the front of the hotel even in the Dubai context where luxury cars are more commonplace than almost anywhere. And that's before the Nth Degree Car Club arrived. We entered the lobby of the hotel; my first visit which now seems like a crime having lived in the Emirates for 6 years. As I look around me I'm amazed by what I see. The lobby is a cavernous atrium, disappearing most of the way up the building’s 56 floors. The architecture is, interesting. Not really my taste but a sight to behold, nonetheless. Everything is enormous. Everything is coloured bright blue, red and yellow. And last, but by no means least, everything is literally dripping in gold. Everything is so very gold. We made our way through the expansive, vivid and somewhat animated, lobby. Up escalators to the lobby mezzanine, past all manner of fountains and statues, we were ushered into an elevator (gold doors, obvio) to thrust us skywards to the bars located at the very top of the building. 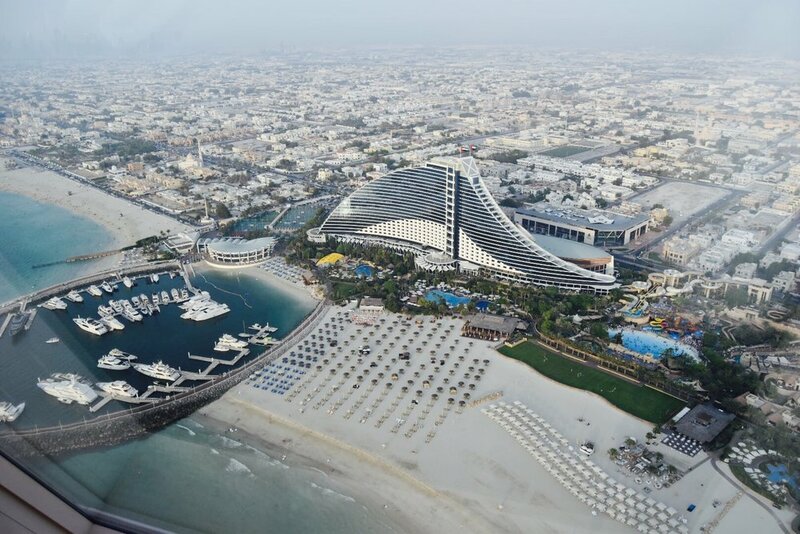 The elevator was glass on the outside which meant we had an amazing view of the beautiful waters of the white sand beaches, Palm Jumeirah and Arabian Gulf below, as we rode towards the heavens. At the end of our elevator ride we emerge into the sky lobby and are shown into our destination – the GoldOn27 bar (Good name, and totally accurate). An event has bought us to the Burj and GoldOn27. Our friends at the Nth Degree Car Club have organised a drinks function and we are early. I am never, ever early for anything. Ever. Especially for an event. But, tonight, Matthew, I am…early. Uncharted territory. My day until now has been spent immac-ing and in a state of preparation. After much consideration I decided to go with a canary yellow pencil skirt and monochrome cropped top. A perfect combo for a late afternoon glitzy kind of event. This look is very en vogue as well as nice and summery. Both pieces were from Bebe earlier that day and a great choice, IMO, at a high-street reasonable price. I’ve combined this with my black Le Silla platform sandals (which have a little flash of gold in the platform and heel: how appropriate) from our last trip to Florence. My look is finished with gold drop earrings and my Valentino Garavani handbag. I simply couldn't resist adding a little print to the situation. The hostess showed us through to the main bar where the event is being held. Being early, we are the only people in the entire place so we grabbed the opportunity to snap shots like true tourists, unburdened with fellow patrons that we would otherwise feel a need to maintain some decorum for. We enjoyed impeccably made and presented cocktails at sunset. The bar has an amazing view back over Dubai towards the Burj Khalifa. One thing the bar does not, however, boast, is a sunset view – the sun going down on the other side of the building. Check out GoldOn27 as a treat for a special occasion or if you are visiting Dubai. You won’t be disappointed (NB: the barman informed us that during Ramadan the bar will undergo some renovations, giving me an excuse to go back soon to check it out). After we finished our cocktails, the Nth Degree Car Club cars arrived, a little later than we had anticipated. We watched a procession of Ferraris, Lamborghinis and other famous marques flood in and around this iconic building. It was an amazing line up so well done to our friends at the Nth Degree Car Club. The event was a great concept at a stunning location. Ramadan Kareem to all my Muslim friends and followers.